the way to control indoor mold growth is to control the moisture. The “trick” (hard part) is to find the molds that cannot be seen. One way to do this is through the use of infrared thermography (see below). It's very common to find molds in homes and buildings. After all, molds grow naturally indoors. 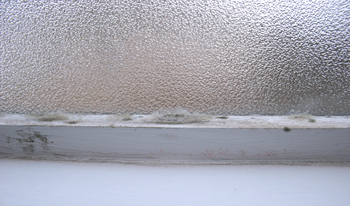 Mold spores enter the home through doorways, windows, and heating and air conditioning systems. Spores also enter the home on animals, clothing, shoes, bags and on people. Much has been made of indoor mold in advertising and the media lately, so it’s a common concern for homeowners and buyers alike. It's common to find mold even in new homes. Whether you’re selling your current home or looking into buying one, it’s vital to get a mold inspection. The presence of active mold can drastically affect the resale value of any home. For homeowners, a mold inspection will either put your mind at rest or make you aware of any problems that could otherwise cause delays or break deals once you’ve entered negotiations with a buyer. A professional mold inspection by OxBow Home Inspections will give you a signed report from an expert, before you put the home up for sale. Imagine being able to show a “clean bill of health” to potential buyers that express concerns – they’ll be impressed by your thoroughness and commitment to your home. For some people, a small exposure to mold spores can trigger an asthma attack or lead to other health problems. For others, symptoms may occur only when exposure levels are much higher. The health effects of mold can vary. The production of allergens or irritants can cause mild allergic reactions and asthma attacks. The production of potentially toxic mycotoxins can cause more severe reactions, and in rare cases death. Should you be concerned about mold in your home? Yes. If indoor mold is extensive, people in your home can be exposed to very high and persistent airborne mold spores. It is possible to become sensitized to these mold spores and develop allergies or other health concerns, even if one is not normally sensitive to mold. "It is not necessary, however, to determine what type of mold you may have. All molds should be treated the same with respect to potential health risks and removal." First, address the source of moisture that is allowing the mold to grow. Then take steps to clean up the contamination. Here are helpful links to lean more about cleaning up mold in your home. If mold is a problem in your home or school, you must clean up the mold and eliminate sources of moisture. Fix the source of the water problem or leak to prevent mold growth. In areas where there is a perpetual moisture problem (bathrooms), do not install carpeting (i.e., by drinking fountains, by sinks, or on concrete floors with leaks or frequent condensation). The key to mold control is moisture control. It is important to dry water damaged areas and items within 24-48 hours to prevent mold growth. If mold is a problem in your home, clean up the mold and get rid of the excess water or moisture. Fix leaky plumbing or other sources of water. Wash mold off hard surfaces with detergent or bleach and water, and dry completely. Absorbent materials (such as ceiling tiles and carpet) that become moldy may have to be replaced. EPA's publication, Indoor Air Pollution: An Introduction for Health Professionals , assists health professionals (especially the primary care physician) in the diagnosis of patient symptoms that could be related to an indoor air pollution problem. It addresses the health problems that may be caused by contaminants encountered daily in the home and office. Organized according to pollutant or pollutant groups such as environmental tobacco smoke, VOCs, biological pollutants, and sick building syndrome, this booklet lists key signs and symptoms from exposure to these pollutants, provides a diagnostic checklist and quick reference summary, and includes suggestions for remedial action. Also includes references for information contained in each section. This booklet was developed by the American Lung Association, the American Medical Association, the U.S. Consumer Product Safety Commission, and the EPA. The EPA Document Reference Number is: 402-R-94-007, 1994.
for information and FAXs, including a list of publications: NCEH Health Line is: 1-888-232-6789. Biological Pollutants in Your Home - This document explains indoor biological pollution, health effects of biological pollutants, and how to control their growth and buildup. One third to one half of all structures have damp conditions that may encourage development of pollutants such as molds and bacteria, which can cause allergic reactions -- including asthma -- and spread infectious diseases. Describes corrective measures for achieving moisture control and cleanliness. This brochure was prepared by the American Lung Association and the U.S. Consumer Product Safety Commission. EPA Document Reference # 402-F-90-102, Jan 1990. One sure fire way to reduce the chances of getting mold is to have a good gutter system installed on your home. Read more about it here. If the conditions that are causing the mold growth in the first place are not corrected, mold growth will return. 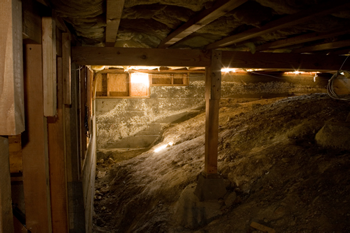 About 50% of mold cases initially go unnoticed because they are hidden behind something (such as a wall). Any Home Inspector will identify and report any visible molds. Problem is… they normally cannot see the mold that has damaged the wall behind the dishwasher, or destroyed the floor under the bathtub. With the latest technology in mold detection, I am able to see many of those molds that used to remain hidden. This new technology is called “Infrared Thermography”, but is often known as Infrared Thermal Imaging. For example, if the previous owner had a water leak behind a wall… fixed the leak and then replaced the damaged drywall with new stuff, nobody would ever know the difference. But what if his leaking pipe started a mold culture in the framing structures of the wall itself? The mold actually changes the thermal transferrence capacity of the wood. With Infrared Thermography technology, I am often able to identify mold growths that before now, would have remained unnoticed. Moisture behind walls, over ceilings, and under floors is often impossible to detect until the problem is excessive and visible to the naked eye. The investigation of not yet visible mold in structures is often difficult to detect, however with modern technology and infrared diagnostics it is now possible to do what was once impossible. Technology has provided a tool that can be used by investigators, remediators and consultants to detect and help eliminate mold infestations. The technological tool is called Infrared Thermography (IRT). It is a technique that produces an image of invisible (to the human eye) infrared light emitted by objects due to the heat, or lack thereof, in the object called its “thermal condition.” The most typical type of thermography camera resembles a typical camcorder and produces live television pictures of heat radiation. More sophisticated cameras can actually measure the temperatures of any object or surface in the image and produce false color images that make interpretation of thermal patterns easier. An image produced by an infrared camera is called a thermogram. To understand IRT as a tool it is necessary to understand how it works. Thermal or infrared energy is light that is not visible to humans because of its wavelength is too long to be detected by the human eye. Thermal or infrared energy (IR) is the part of the electromagnetic spectrum that we perceive as heat. Unlike visible light, in the infrared world, everything with a temperature above absolute zero emits heat. Even very cold objects, like ice cubes, emit infrared. The higher the object’s temperature, the greater the IR radiation emitted. Infrared allows people to see what their eyes normally cannot. IRT cameras produce images of invisible infrared or “heat” radiation. The IRT camera can provide precise non-contact temperature measurement capabilities. The existence of moisture (normally cooler than normal construction materials) can be used to detect conditions that promote mold growth. Mold related problems can be detected before the mold is visible to the eye or detectable by the nose. IRT cameras are extremely cost-effective, valuable diagnostic tools in construction related problems of water intrusion and mold growth. But finding a problem with an infrared camera is not a solution. It is only the start of an investigation that will help the property owner or developer to stop a problem before it becomes serious. The use of a thermal imaging camera can provide valuable information during moisture assessments, remediation oversight, energy audits, roof and electrical system inspections and water damage investigations. Temperature difference caused by evaporation, radiation, thermal bridging, infiltration/exfiltration, and other sources must all be carefully evaluated. The time saved using infrared, and the larger areas covered rapidly by an IR camera, can save time and money by providing a faster, more efficient and more reliable survey. An IR camera can detect moisture located behind interior walls under the right conditions. The temperature difference created by the presence of moisture on the inside surface of a wall appears differently than the surrounding area. Sample photos of Infrared Thermography are posted on my "Difference" page. I am certified by the Environmental Solutions Association. Return to "About Your Home"